When you come to go to buy Turquoise wherever you go, you need to know how to buy real Turquoise. It does not matter if you go to the Santa Fe Indian Market or buy Turquoise in a gallery or on the internet, be sure and ask the seller about the type of turquoise you are purchasing. You need to know if you are indeed going to buy real Turquoise. When you want to know whether you are going to buy real Turquoise or not, you need to seem educated, even if you are not. To become educated you can visit www.durangosilver.com and go to their jewelry learning center. If you know how to buy real Turquoise, you know you need to ask a few novice or basic questions. 1.) You need to first ask is this authentic, REAL Turquoise? 3.) You should ask then, has this Turquoise been dyed? 4.) Is this Turquoise reconstituted (crushed and put back together)? 5.) Is this stone really howlite or magnasite that is dyed and is being sold as Turquoise? 6.) Where did the Turquoise come from? 7.) Did you cut the Turquoise, who did? These are all good questions, however if the merchant is simply buying and selling merchandise from artists, then they will not know much about the stones, other then what the jeweler or wholesale dealer told them. Many dealers do not know how to buy real Turquoise. If you can it would be preferable to buy real turquoise mine direct, artist direct, or from a trusted dealer such as Durango Silver Company, Waddell Trading Company, Garland’s, Winfield Trading Co. or the like. These dealers have been in business for many generations and specialize in real Turquoise, and know how to buy real Turquoise. Next Best – Stabilized turquoise will also be a natural stone but mineral is added to it to make the stone harder and safer for wear in jewelry. The jeweler uses a substance, usually a natural mineral. It is infused right into the surface of the stone. Stabilized turquoise won’t change color over time. Artificially Colored Turquoise – Enhanced or color treated turquoise is also infused but with the goal to change the color of the stone. Dye is mixed with the stabilizing material. Most good jewelry makers will not used turquoise with artificial color. 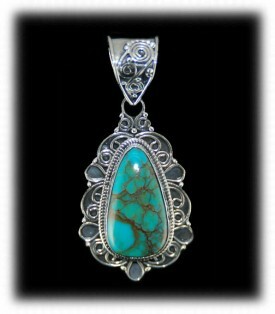 Besides, there are so many beautiful colors of turquoise stone. Why would you want to do this? Reconstituted Turquoise – In order to make a stone, turquoise dust and small pieces are mixed with resins and pressed into a stone-like form. This type of stone will retain the turquoise color but is not really a stone. Fake Turquoise – People can make turquoise color beads and stones for jewelry with plastic and other materials. The inexpensive tourist shop jewelry may well be fake. Steer clear unless you are buying a necklace for your 5 year old grand-daughter, perhaps! A good trader or jewelry maker will tell you about the stone. If you don’t ask, you may not find out if the stone is natural or not. The best way to start this conversation is to ask, “Is this stone natural turquoise?” As far as what to buy… a natural stone or stabilized stone is the best. All the others are not “real turquoise stones” in my opinion! Don’t forget these are just some of the tricks and products available. Your best bet in to buy real Turquoise is to buy it from a reputible dealer. You want to buy real Turquoise for many reasons, including collectiblity, healing, and more. Thank you for reading our article about how to buy real Turquoise.